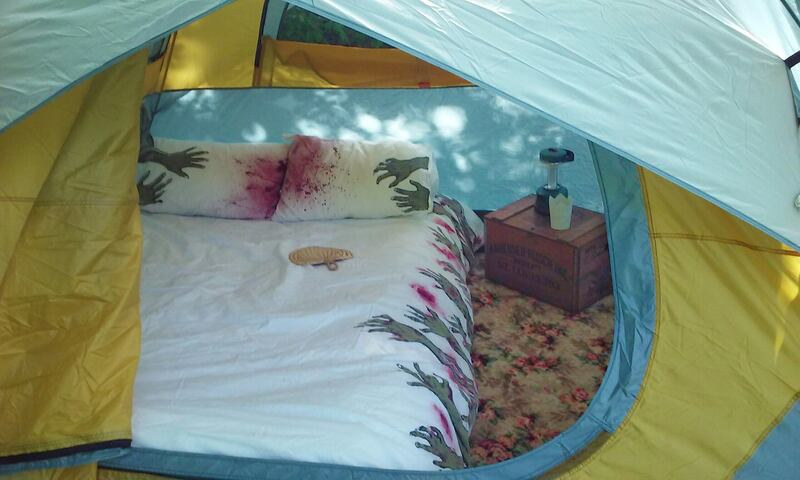 I’ve been looking at instant tents for a while, but was a bit leery because I wasn’t sure if they would break easily. 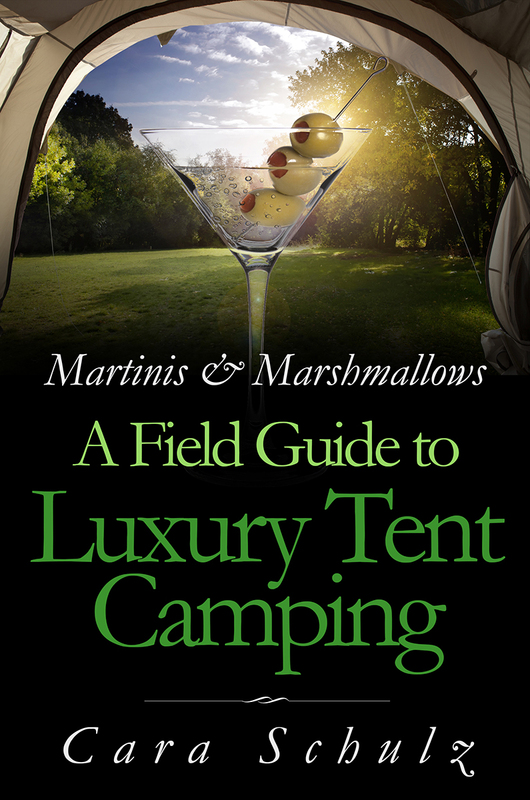 And they were very expensive compared to the same size traditional tent. 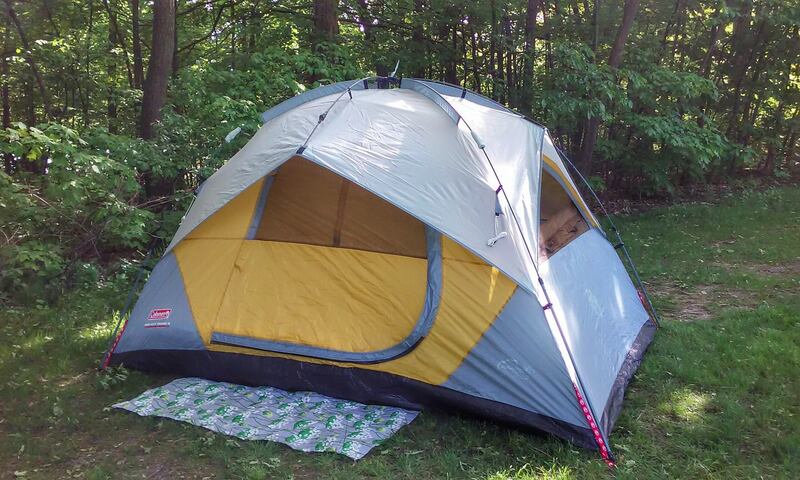 Then I saw a Coleman 7×10 instant dome tent at Costco for about $80 and decided to try it out. I have a huge 16×16 tent that I use for week long camping trips, but use a small, red 7×8 dome for weekends. The drawback on the red tent is that there is pretty much zero place for gear if you use a queen mattress and you have to crawl in and out of the tent because the ceiling height is so low. Room for a queen size mattress w/ 5 x 7 left over for gear. Which brings me to the review for the Coleman instant dome. Yes, it really does set up in 2 minutes flat. Even the first time, without looking at directions. It packs down that fast, too. I had a queen mattress in there and felt like I had an AMAZING amount of room for gear. With a ceiling height of 5ft4 I was able to stand up in the tent. My husband, who is 5ft 10 couldn’t fully stand up, but he could exit and enter the tent like a human being rather than a mole crawling out of a hole. We both could change clothes with ease. The extra ceiling height also helped you feel less cramped. It’s an attractive tent. Not normally a fan of yellow, but the yellow + silver/blue is very nice to look at. The rain fly in not going to cut it if it does more than sprinkle and you want to keep the window flaps open. If you put your air mattress going vertical to the door (as in the photo) your head and foot of your mattress will touch the walls. And we all know that’s a big no-no in case it rains because it will let rain in through the wall material. If you put your mattress horizontal to the door, you drastically cut down on the amount of storage/open floor space in the tent. The pros absolutely outweigh the cons for me – especially since I ALWAYS bring a large tarp and tarp my tent if it starts to rain. Experience has taught me to never trust a rainfly – especially since wind can drive rain up and under most tent rainflys. So the cons for this tent are eliminated by my standing policy to always tarp a tent if it’s raining. My bottom line – excellent tent if you can get it for $80 at Costco or another discount place, I wouldn’t spend $150 for this tent. The bedding is a duvet cover and pillow cases hand painted by Christie Melissa. The bed side table is a vintage beer case. Great to store clothes and to use as a bedside table. I also pack my air bed pump in there and the lamp when transporting to and from the campsite. The rug is a very old (very very very) rug from Sears. I got it for free from my sister and it’s a perfect size for the tent and since it’s so old, I’m not too worried about it getting damaged. Having a rug covering the entire floor makes a huge improvement in the comfort level of your tent.